“There is nothing more important to improve humanity than education,” said John A. Paulson. "Today’s gift will help continue that legacy by making SEAS a 21st-century engineering leader." Paulson's $400 million endowment will support the School of Engineering and Applied Sciences. 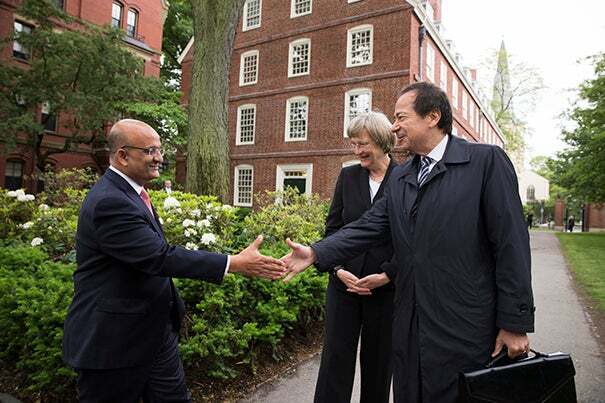 The School is also planning for expansion into Allston, where its scientists and engineers will occupy state-of-the-art research and teaching facilities within a campus anchored by science and adjacent to Harvard Business School (HBS) and the Harvard Innovation Lab (i-lab). In Allston, SEAS will be at the center of a community of entrepreneurs and innovators in an emerging research enterprise zone. Paulson’s gift comes in the midst of The Harvard Campaign, publicly launched in September 2013. The campaign seeks to raise $6.5 billion to shape the future of education with a focus on University aspirations, including advancing new approaches to teaching and learning, attracting and supporting the best students and faculty, creating a campus for the 21st century, and supporting multidisciplinary research. “SEAS is the next frontier for Harvard, and its expanding campus in Allston promises to become the next major center of innovation. As an alumnus of Harvard, one who has benefited greatly from the education I received here, it is both a privilege and an honor to support this endeavor,” he added. Through research and teaching, SEAS faculty and students address some of the greatest challenges facing society. SEAS laboratories have achieved remarkable discoveries, including recent breakthroughs such as an organ-on-a-chip platform that can be used for drug testing, a swarm of self-organizing robots, novel nanotechnology devices that are changing optical electronics, an implantable cancer vaccine, new knowledge about the links between atmospheric chemistry and climate change, and a robot that can assemble itself from a flat sheet. SEAS also offers all Harvard College students an introduction to engineering and technology — essential knowledge for leaders in any field in the 21st century. Alumni include former Microsoft CEO Steve Ballmer ’77, NASA astronaut Stephanie Wilson ’88, U.S. Secretary for Housing and Urban Development Shaun Donovan ’87, M.Arch. ’95, M.P.A. ’95, and Zappos CEO Tony Hsieh ’95. Student interest in engineering and applied sciences continues to grow rapidly. The number of undergraduate concentrators has risen exponentially in recent years, and this past year the introductory computer science course CS50 became the most popular course at the College, with more than 800 registered students. Incoming dean Francis J. Doyle III will serve as the inaugural John A. Paulson Dean of SEAS, in addition to his assuming the John A. and Elizabeth S. Armstrong Professorship of Engineering and Applied Sciences. Paulson graduated from HBS with high distinction in 1980. He founded Paulson & Co. in 1994 with $2 million and one employee. Today the company, which specializes in alternative investments, manages more than $19 billion and employs more than 125 people worldwide. Over the course of his career, Paulson has given generously to support a number of causes, including in education, the arts, health care, and conservation. He also serves as a board member to a number of nonprofits, including the Harvard Business School Board of Dean’s Advisors, the New York University Board of Trustees, the 92nd Street Y, the Central Park Conservancy, the Metropolitan Museum of Art, and the Council on Foreign Relations. Cynthia A. Torres ’80, M.B.A. ’84, who will conclude her role as president of the Harvard Alumni Association, announced the newly elected Board of Overseers during Thursday's Afternoon Program.